I’ve always been a big treat yourself, YOLO kind of girl. Especially when it comes to desserts. Growing up my grandma, who I inherited my major sweet tooth from, would always remind me to save room for dessert — even if that meant not being able to finish all of my dinner. While I can definitely get behind sugar-free healthier desserts, I’m still going to lean toward the indulgently rich options. So when an unapologetically delicious ice cream brand called Vice Cream launched in all Publix grocery stores across Florida I had to see what all the hype was about. Vice Cream comes in five decadent, playful flavors with cheeky names such as Breakfast in Bed, Toffee Wife and Afternoon Delight. The brand was founded in 2016, by cancer survivor Dan Schorr. In 2014, Dan was diagnosed with an aggressive form of lymphoma and told he would have 12 weeks to live without treatment. That’s when he decided he would not just live his life, he would indulge in it — that’s my kind of guy! An ice cream fanatic whose summer job in college was driving a Good Humor ice cream truck, Dan had a vision of creating the most decadent premium ice cream brand that would make fun, humor and giving back to the cancer community a central part of its mission. Dan was went through treatment at the Dana-Farber Institute in Boston, and as of August 2016 has been fortunate to say he’s cancer free. He has since created the ice cream of his dreams. Vice Cream hit the shelves in just 20 stores in Boston, and is currently in over 5,000 stores along the East Coast and the South. Breakfast in Bed: Maple ice cream with chunks of sticky bun dough, pecan praline and a touch of cream cheese. Afternoon Delight: Creamy vanilla ice cream with chunks of chocolate chip cookie dough, salted caramel truffles and swirls of chocolate fudge and caramel. 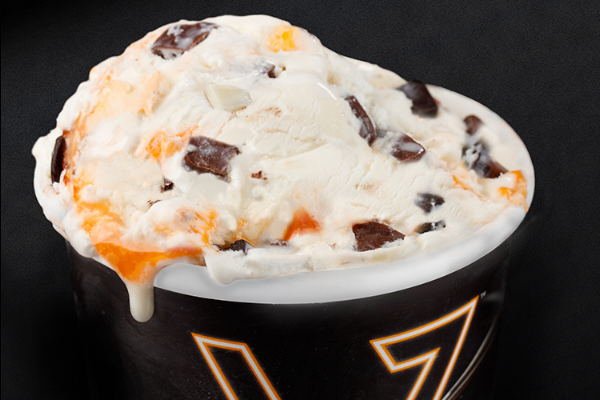 Toffee Wife: Peanut butter ice cream mixed with chopped toffee bars, peanut butter cookie dough and toffee swirl. Choc of Shame: Rich chocolate ice cream with brownie dough chunks and dark chocolate shavings. Higher Grounds: Dark roast coffee ice cream with swirls of mocha fudge, crunchy chocolate cookie crumbles and espresso beans. Of course I had to try them all. If you’re a fan of rich creamy ice cream, then this is the brand for you. I’m a sucker for anything and everything chocolate so the Choc of Shame was the first to completely disappear in my house. But I’m sure I’ll be guilty of buying each and every flavor again in the near future. Be sure to check out Vice Cream at your local Publix. If you start to feel guilty about how indulgent and delicious it is, don't! You've got one life to live, so make it count!